I attended my third track-day event this past weekend at Texas World Speedway (TWS) in College Station, TX. This was my first time driving with Driver’s Edge, a track day events organization based in Texas, which runs several different tracks in the area. This was also my first time at TWS, an old stock-car style super speedway built in 1969 with a banked oval and large grandstands. NASCAR and IRL used to race it up until the 1980′s, when it fell into disrepair and was dropped from the schedule. 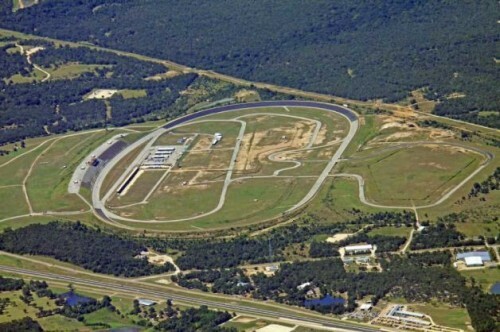 It now serves primarily as an amateur racing facility and test track for NASCAR. I really liked this track, it was only about 1.8 hours away from my home, so I was able to stay at the house rather than paying for a hotel. It also has a lot of variety, with on and off camber turns, banking, a long high speed section, and some fairly technical sections as well. We ran the 2.9mile clockwise (CW) configuration both days, but did conduct one parade lap on Sunday in the CCW configuration. I was even able to get the M Coupe up to ~138mph on the front curved banking before hitting the braking zone. It has a little bit of elevation change, though not as abrupt as Harris Hill. Fortunately TWS was more forgiving than H2R when it came to track surface, though there were a few bumpy sections. As for Driver’s Edge, I couldn’t be more pleased with their program. They had excellent instructors, great classroom lessons, and promoted a very friendly atmosphere. I’ll definitely be looking to do more events with them. They were equally professional as the BMWCCA event I attended, but a little more relaxed. That said, they were very serious with safety. They had nearly every corner station manned, and their workers were very proactive to throw a passing flag. I only got caught in a couple trains of traffic, but a 2.9 mile course allowed for lots of open-track driving. The Green group I was in was very eclectic, stock Honda Accords to fully race-prepped Corvettes and everything in-between. There was even a brand new F10 M5 in the group. If you haven’t seen it yet, here’s a link to the photos I took of the cars in the paddock and garages. There were a lot of cars there, lots of very high-end stuff like Viper ACRs and Porsche GT3′s. I even saw some familiar faces from my previous track events, and this time I wasn’t the only M Coupe. In total there were four M Coupes, three S54s and one S52. There were also a couple S54 Roadsters and plenty of E36s and E46s. I even saw a single MR2 Spyder, though I wasn’t able to catch the owner. This was also my first track day where I attempted to use my new GoPro Hero 3. I tried a few different configurations to see which worked best, I still need to play around with the options on the camera itself. I also would like to do something about the sound recording so you can actually hear the engine note, rather than the deafening wind noise. The video below was my first session on Saturday. I decided the interior view wasn’t great, the big M Coupe rear-view mirror blocks most of the view. 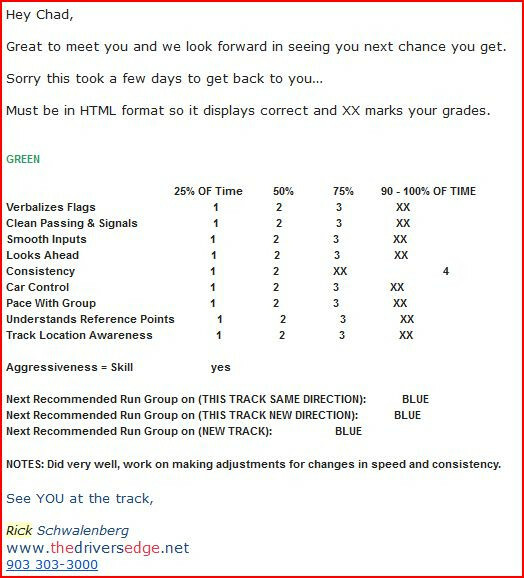 My report card from the Driver’s Edge Event at TWS. They grade you on your second day to see if you are ready to move up to the next run group.